This recipe came to me working at the deli, where rotisserie chicken is always on the menu. Pesto Caprese Chicken is super versatile – make it into a salad by cooling and serving over greens, mix with pasta or top slices of toasted baguette and voila! Bruschetta! The possibilities are endless. Set the oven to broil, mix tomatoes and olive oil, broil in a 9×13″ baking dish until the skin just begins to split, about 5 minutes. In a medium mixing bowl, combine chicken, pesto, water and basil. 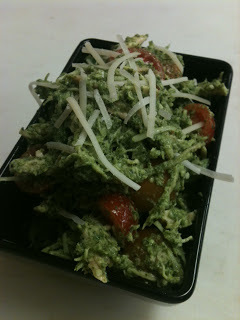 Pour chicken mixture into tomato dish, toss with tomatoes, and sprinkle with Parmesan cheese. Bake in the oven until the Parmesan melts, about 5 minutes. Crack fresh pepper over top and serve.